A full body treatment which includes exfoliation and an algae mask with a heated blanket. This treatment softens the skin while nourishing and promoting cellular repair. The treatment finishes with a relaxing scalp massage. 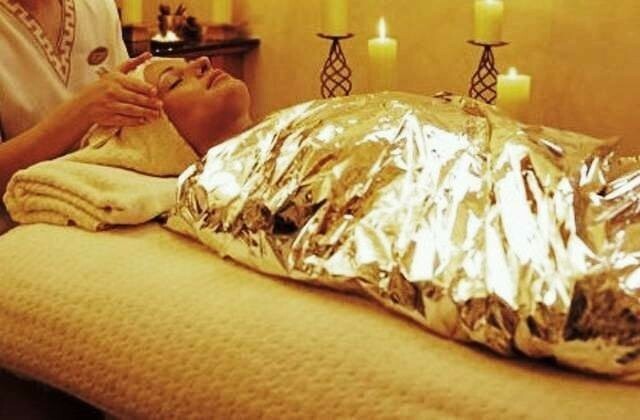 Sedona Mud Wrap – For circulation and detoxification, this special mud mixture of minerals is from the southwest region of the United States. It has been used for centuries by the Southwestern Indians to enhance the beauty of the skin and is known to have potential healing powers for numerous muscle ailments. This luxurious mud treatment is a terrific way to bring your skin and body back to a balanced, mineral enriched state. This vigorous scrub stimulates healthy circulation while thoroughly exfoliating and polishing off dead, devitalized skin. These salts are infused with Rosemary, Lemon Peel and Safflower Seed oil. Rosemary and Lemon Peel act as natural astringents promoting a healthy glow and Safflower Seed oil helps to smooth and soften dry, tired skin. This invigorating treatment is followed by an application of Deep Forest Oil. Contraindications: Pregnancy, Sensitive skin, Open Cuts, Shaving or waxing is not recommended the day of the service. Luxurious oils mixed with calming Chamomile and combined with granulated sugar will refresh and rejuvenate the skin, leaving it feeling fresh, smooth and glowing. Exfoliated lately?